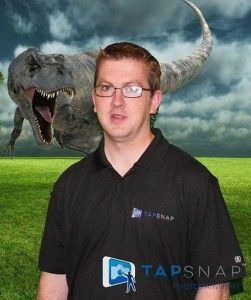 Billy Wedgworth of Lexington, Kentucky has an interesting perspective that he is able to bring to TapSnap. In his former role as a funeral director, Wedgworth came to understand the emotional power that photography plays on people. In essence, Wedgworth was touched by peoples’ use of images to resurrect memories of their loved ones. Framed photos covered every inch of the funeral parlor, depicting happier times from moments long ago. Images are an important resource for grieving families in time of need. This understanding of the power of photos, his love of photography, and a desire to open a business motivated Wedgworth to join TapSnap. Wedgworth is excited to help people preserve memories by taking pictures of their special moments. TapSnap’s reinvented photo booth provides unlimited room for creativity, allowing people to snap photos during events without the constraints of walls or a ceiling.